TI finally converted its Nspire calculators to the iPad platform and through this weekend only in celebration of 25 years of Teachers Teaching with Technology, they’re offering both of their Nspire apps at $25 off their usual $29.99, or $4.99 each. This is a GREAT deal, especially considering everything the Nspire can do! Clicking on either of the images below will take you to a description page for that app. In my opinion, if you’re going to get one of these, I’d grab the CAS version. It does EVERYTHING the non-CAS version does plus great CAS tools. Why pay the same money for the non-CAS and get less? 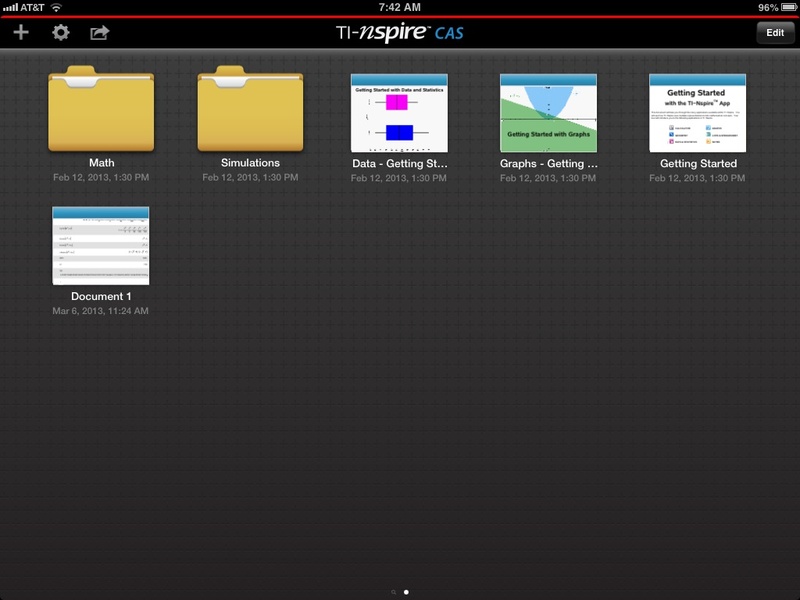 You aren’t required to use the CAS tools, but I’d rather have a tool and not need it than the other way around. If you read my ‘blog, though, you know I strongly advocate for CAS use for anyone exploring mathematics. Now, on to my brief review of the new apps. MY REVIEW: From my experimentations the last few days, this app appears to do EVERYTHING the corresponding handheld calculators can do. I wouldn’t be surprised if there are a few things the computer version can do that the app can’t, but I haven’t been able to find it yet. In a few places, I actually like the iPad app better than either the handheld or computer versions. Here are a few. When you start the app, your home page shows all of the documents available that have been created on the app. It’s easy enough to navigate there on the handheld or computer, but it’s a nice touch (to me) to see all of my files easily arranged when I start up. A BRILLIANT addition is the ability to export your working files to share with others. Using the standard export button common to all iPad apps with export features, you get the ability to share your current doc via email or iTunes. 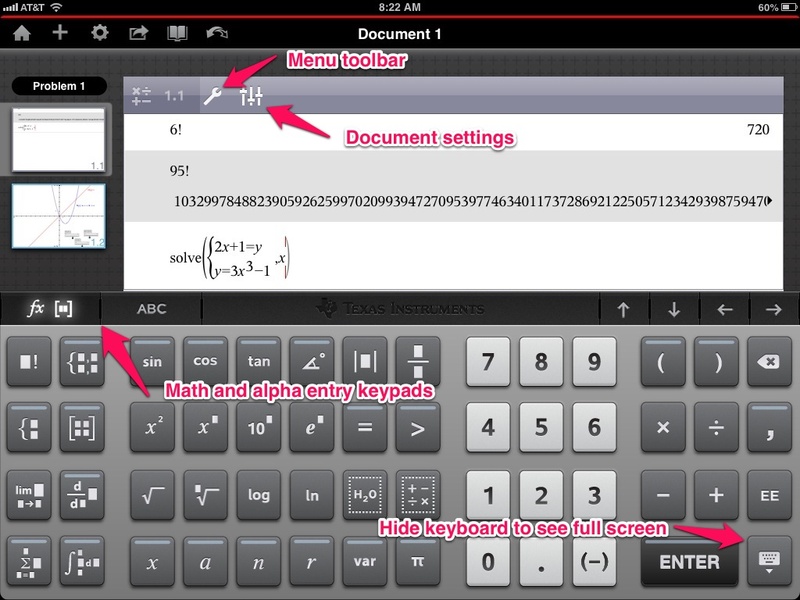 The calculator history items can now be accessed using a simple tap instead of just arrow key or mouse navigation. Personally, I find it much easier to access the menus and settings with conveniently located app buttons. I prefer having my tools available on a tap rather than buried in menus. A nice touch, from my perspective. Moving objects is easy. I was easily able to graph and the generic with sliders for each parameter. It’s easy to drag the slider values, and after a brief tap-and-hold, a pop-up gives you an option to animate, change settings, move, or delete your slider. Also notice on the left side of the three previous screens that you have thumbnails of your currently open windows. With a quick tap, you can quickly change between windows. One of the best features of the Nspire has always been its ability to integrate multiple representations of mathematical ideas. That continues here. As I said, the app appears to be a fully-functional variation of the pre-existing handheld and computer versions. 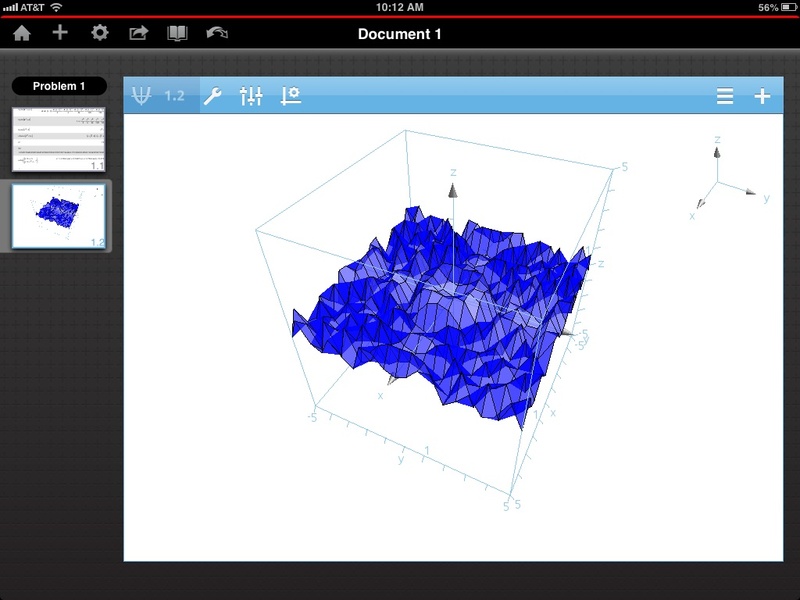 The 3D-graphing option from a graphing page seems much easier to use on the iPad app. Being able to use my finger to rotate a graph the way I want just seems much more intuitive than using my mouse. As with the computer software, you can define your 3D surfaces and curves in Cartesian function form or parametrically. A lovely touch on the iPad version is the ability to use finger pinch and spread maneuvers to zoom in and out on 2D and 3D graphs. Dragging your finger over a 2D graph easily repositions it. Combined, these options make it incredibly easy to obtain good graphing windows. For now, I see two drawbacks, but I can easily deal with both given the other advantages. This concern has been resolved. See my response here. 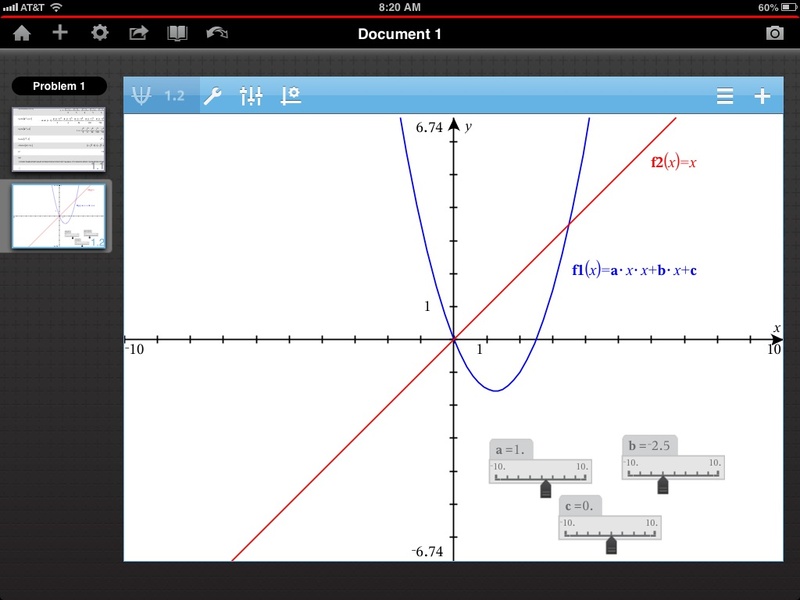 At the bottom of the 3rd screenshot above, you can see that variable x is available in the math entry keyboard, but variables y and t are not. You can easily grab a y through the alpha keyboard. It won’t matter for most, I guess, but entering parametric equations on a graph page and solving systems of equations on a calculator page both require flipping between multiple screens to get the variable names and math symbols. I get issues with space management, but making parametric equation entry and CAS use more difficult is a minor frustration. I may not have looked hard enough, but I couldn’t find an easy way to adjust the computation scales for 3D graphs. I can change the graph scales, but I was not able to get my graph of to look any smoother. As I said, these are pretty minor flaws. CONCLUSION: It looks like strong, legitimate math middle and high school math-specific apps are finally entering the iPad market, and I know of others in development. TI’s Nspire apps are spectacular (and are even better if you can score one for the current deeply discounted price). I’ve rarely been so jazzed by a piece of software that I felt compelled to write a review of it. There’s plenty of folks doing that, so I figured there was no need for me to wander into that competitive field. Then I encountered the iPad Air Sketch app (versions: free and $9.99 paid) last Monday and have been actively using in all of my classes since. –Rather than simply projecting my computer onto a single screen in the room, I had every student in my room tap into the local web page created by Air Sketch. Projection was no longer just my machine showing on the wall; it was on every student machine in the room. Working with some colleagues, we got the screen projections on iPhones, iPads, and computers. I haven’t projected onto Windows machines, but can’t think of a reason in the world why that wouldn’t happen. –In my last class Friday, I also figured out that I could project some math software using my computer while maintaining Air Sketch notes on my kids’ computers. No more screen flipping or shrunken windows when I need to flip between my note-taking projection software and other software! 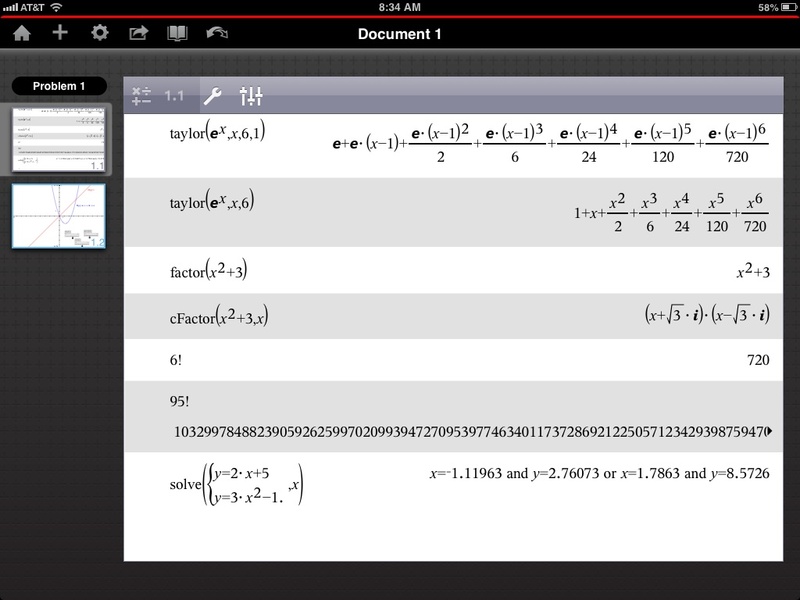 –When a student had a cool idea, I handed my iPad to her, and her work projected live onto every machine in the room. About half of my students in some classes have now had an opportunity to drive class live. –This is really cool: One of my students was out of country this past week on an athletic trip, so he Skyped into class. Air Sketch’s Web page is local, so he couldn’t see the notes directly, but his buddy got around that by sharing his computer screen within Skype. The result: my student half way around the globe got real-time audio and visual of my class. –This works only in the paid version: We reviewed a quiz much the way you would in Smart Notebook—opened a pdf in Air Sketch and marked it live—but with the advantage of me being able to zoom in as needed without altering the student views. –Finally, because the kids can take screen shots whenever they want, they grabbed portions of the Air Sketch notes only when they needed them. My students are using laptops with easily defined screen shot capture areas, but iPad users could easily use Skitch to edit down images. –Admittedly, other apps give smoother writing, but none of them (that I know) project. Air Sketch is absolutely good enough if you don’t rush. By the way, the paid version is so much better than the free, allowing multiple colors, ability to erase and undo, saving work, and ability to ink pdfs. Big down side: When you import a multi-page pdf, you can scroll multiple pages, but when creating notes, I’m restricted to a single page. I give my students a 10-15 second warning when I’m about to clear a screen so that any who want cant take a screen shot. It would be annoying to have to save multiple pages during a class and find a way to fuse all those pdfs into one document before posting. The ad on the Air Sketch site was (TO ME) a bit misleading when it showed multiple pages being scrolled. As far as I can tell, that happened on a pdf. Perhaps it’s my bad, but I assumed that could happen when I was inking regular notes. Give me this, and I’ll drop Smart Notebook forever. Admittedly, SN has some features that Air Sketch doesn’t but I’m willing to work around those. Overall, this is a GREAT app, and my students were raving about it last week. I’ll certainly be using it all of my future presentations.